country music public relations and Webster PR. Webster PR clients are once again recognized for their trailblazing success in Billboard’s ‘Greatest of All-Time Country Albums’ chart. The full chart can be viewed on Billboard’s website here and listened to on Spotify. “We’re thrilled our artists are getting the recognition they deserve! 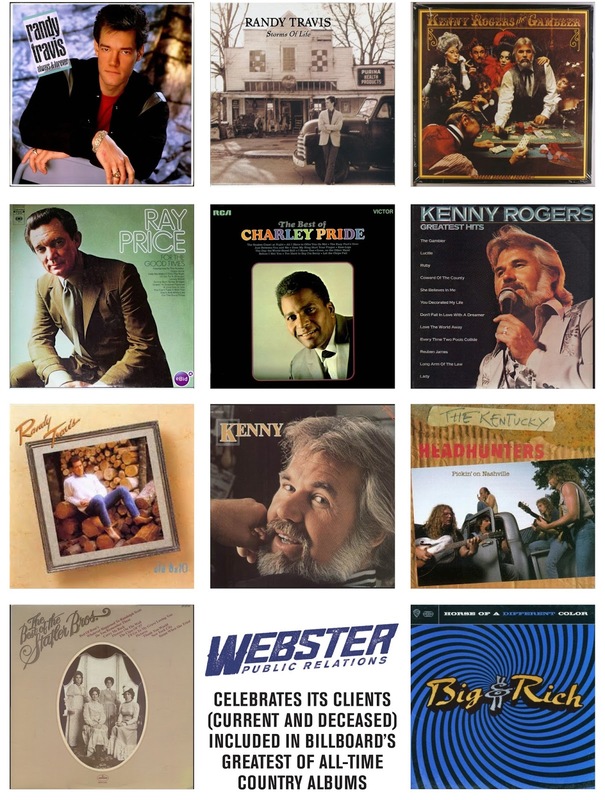 From Randy Travis to Big & Rich, these acts defined how to entertain and make music for decades to come,” said Webster Public Relations president Kirt Webster. According to Billboard, the Greatest of All-Time Country Albums are based on weekly performance on Top Country Albums (from its Jan. 11, 1964 inception through June 4, 2016). Titles are ranked based on an inverse point system, with weeks at No. 1 earning the greatest value and weeks at lower spots earning the least. Due to changes in chart methodology over the years, eras are weighted differently to account for chart turnover rates over various periods.